Changing the look of our home is something that we have all consider from time to time. Many reasons come up as to why we haven’t done it. Money, time and effort are too common. But giving your home a new look doesn’t have to break the bank and it certainly doesn’t have to take months of planning and implementation. There are simple but very effective ways to give your home a new look. A great example of that is a new garage door. If you can’t see how a new garage door could change the look of your home, then consider the following. Gone are the days where the garage door was simply a drab, functional piece of equipment on your home. Now they can be as reflective of your style as the colour you choose to paint the interior of your home. Examples of this have begun to pop up all over garage doors in Melbourne. From custom jobs with vented doors through to sectional garage doors made of different materials. Instead of sticking with the colour scheme or material of your home, consider making the garage door a feature of its own. If your home has a darker exterior, consider a timber sectional or timer roller. The contrast of colours will make the outside of your home pop. If you are a fan of modern-day spy movies, then perhaps blending the garage door into your exterior is what you are after. Garage doors come in many different materials and colours, meaning you can easily match it to the existing exterior colour. The result is a completely transformed exterior. When friends or family drive up, they make be confused, but that will quickly turn to awe when the garage door seemingly opens out of nowhere. Matching or painting garage doors to the colour of your exterior won’t be for all, but for those that are after a defining feature worth talking about, this style will definitely add appeal. Not to mention the complete makeover it will give your home. A garage door, to some, can be seen as a means of protecting your home and keeping unwanted guests out. But for others, the garage can seem like a wasted space that is simply dark and shut in. With a custom garage door, you can now make that area as open plan as the rest of your home. Not to mention the effect it will have on the exterior of your home. For example, designing and installing a garage door with a cut out bar design can not only make the area more open but allow light and air to travel through. The area instantly becomes more attractive and it will certain help change the exterior look of your home, as well as the interior if you decided to convert it into a room. This style is certain to turn a few heads and help make the entire space more appealing. A garage door can be a cost effective and time efficient way to change the entire exterior look and feel of your home. From timber to sectional metals, the options are a plenty. Depending on the style you like and the existing colour schemes, a new garage door has the ability to transform the exterior of your home. Not to mention, a professional will install and make sure it is working properly. 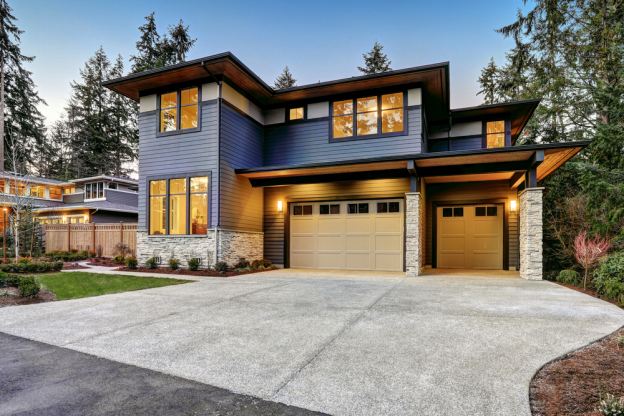 If you aren’t sure where to start, or are simply looking for a few ideas, consider these styles to help transform your home with a new garage door.